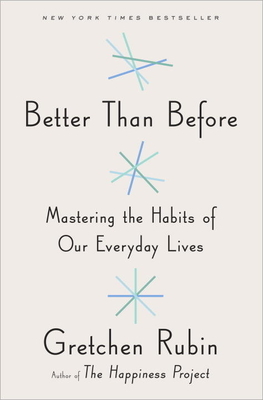 Gretchen Rubin, a member of Oprah's SuperSoul 100, is one of the most thought-provoking and influential writers on the linked subjects of habits, happiness, and human nature. She’s the author of many books, including the blockbuster New York Times bestsellers, Happier at Home and The Happiness Project. Rubin has an enormous following, in print and online; her books have sold more than a million copies worldwide, in more than thirty languages, and on her popular daily blog, gretchenrubin.com, she reports on her adventures in pursuit of habits and happiness. Her podcast "Happier with Gretchen Rubin" was an iTunes "Best of 2015" pick. She was chosen for the 2016 Oprah Super Soul 100 list. Rubin started her career in law, and was clerking for Justice Sandra Day O'Connor when she realized she wanted to be a writer. She lives in New York City with her husband and two daughters.